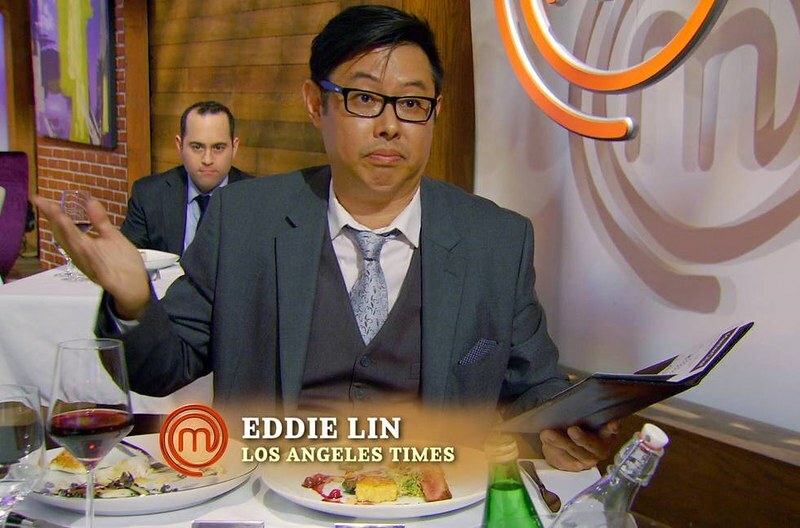 17 Vs. 4 During MasterChef Season 7's Critics' Choice Episode. 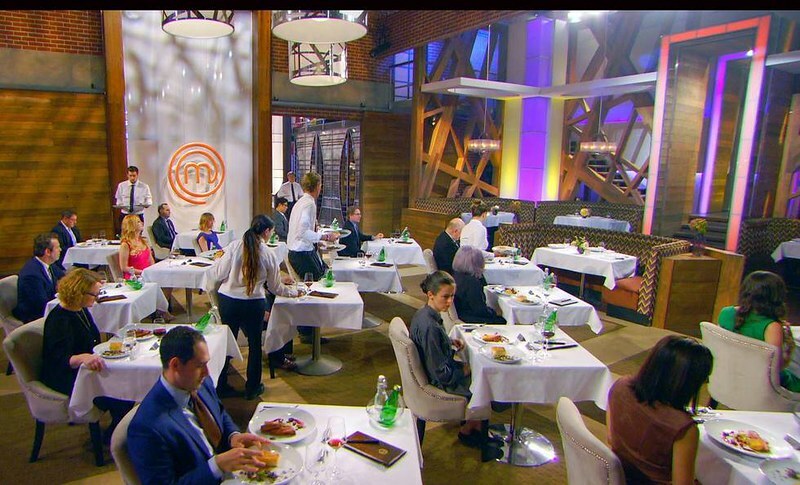 Final Four Competitors Try to Impress 17 Restaurant Critics. Guess Who's One of Them? 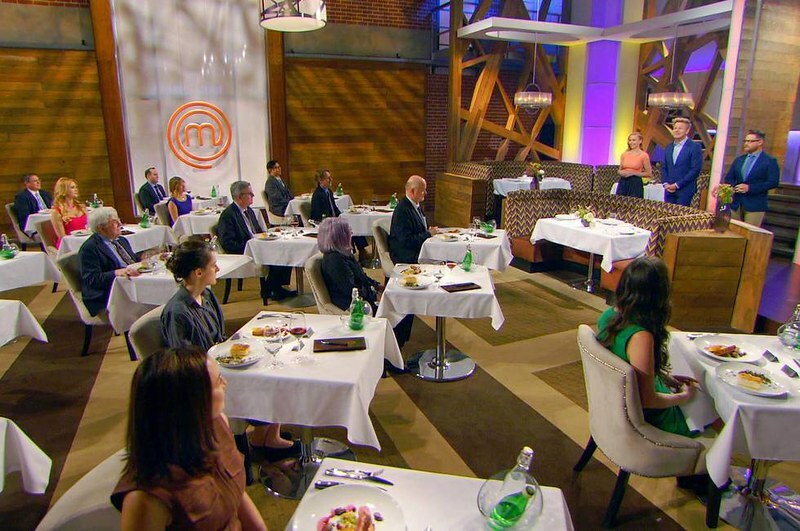 That's me in the MasterChef dining room! Obviously I can't say much here because "spoiler alert" and that terrifying non-disclosure agreement I signed. But, I can tell you that there were 17 renown critics from all over the country. Some I didn't know. Others I respect and am even a bit of a fanboy for; e.g., Jeffrey Steingarten. He's a long-time food writing legend and national treasure. I had the pleasure of helping him up and down the tricky catwalk in the soundstage. Also, meeting Amanda Hesser of Food52 was great. I've been following her ever since I got into food blogging 12 years ago. It was fun giving Adam Sachs, editor-in-chief of Saveur, L.A. dining tips. If he had been in town longer, I would've taken him to all my favorite San Gabriel Valley dumpling spots. Even my former editor from Los Angeles Magazine, Lesley Suter, was there! 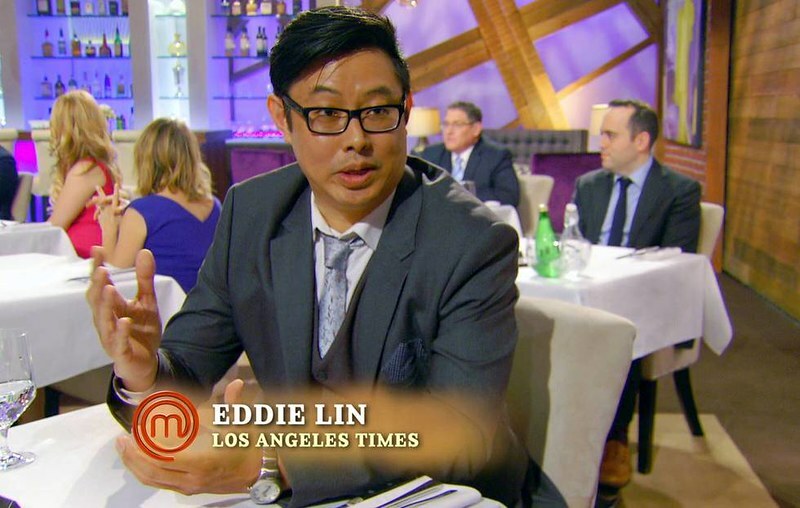 This MasterChef will be my third appearance on the show and the biggest for me; it's the Final Four show with a lot at stake. It's also the first appearance, I believe, for one of the rotating chef-judges, Richard Blais. I've never heard of or met him before the taping, but he was quite friendly and easy to get to know. A little behind the scenes peek: we were in a "holding" tent outside of the soundstage. There, we food writers and critics got to know one another as we snacked on an endless bounty of food. We had to be careful not to fill ourselves up, otherwise what good were we? We still needed to sing, or rather critique, for our supper. Gordon Ramsay, Christina Tosi and Richard Blais visited the tent before we were led into the stage for our grand entrances. It was good chatting with Gordon ahead of the taping. But none of that matters in the end. You just want to know how the food was, what my fellow food critics thought, and, most of all, which team won us over with their tantalizing creations. But, of course, you'd rather see all of this unfold for yourself. So watch tonight, Wednesday, September 7 at 8/9c pm on FOX or online after it airs. So what did I think? Hmmm, that's a pretty good poker face I have going on, isn't it? Thanks for stopping by and hope you enjoy the Critics' Choice episode.